Boston based musician, photographer, sports geek, and ramen addict. When it comes to playing board games, I’m mostly what you would refer to as a “sore winner.” I pride myself on my ability to learn the strategies of the game fast and not only use my strengths well, but exploit my opponents weaknesses. However, when it comes to Terraforming Mars, I’ve not quite mastered that luck just yet. When we decided to play today, I only had one goal in mind: Beat Hei Lun. It’s one thing that he’s very good at playing this game, but he’s currently undefeated. There’s only one known time that he didn’t win, and that was because he wasn’t there that night. I need to win obviously, but I’ll take a consolation prize of at least doing better than him. The game always starts off slow for me, I never typically am able to get a good jump on the game, I’m better at late game strategy, but in the case of this game I had some luck. First, We were playing the advanced game “Hellas,” which meant starting off with disadvantages including not having a ready stock of resources. The only resource I would have at the gun was Titanium, by starting with the Saturn Systems Corporation. This would be a great advantage, because the card in my initial starting hand would be “Security Fleet”: Each turn I may change one titanium into a Fleet Ship, every Fleet ship at endgame would equal 1 Victory Point. Spoiler Alert: this turned into 10 VPs. Hei Lun would also have an incredibly fast start a he paired Interplanetary Cinematics (which start with 20 steel), and Advanced Alloys, which increased the value of each steel to 3 and titanium to 4, meaning he would have 60 Steel to build with early in the game. In terms of early game strategy, Hei Lun’s card would allow him to build more buildings allowing more resources to flow, my card would be better for the longer late game points, but not effectively help me grow early. For the first 2/3rd’s of the game I was able to keep pace on the Points track for one reason: Security Fleet. 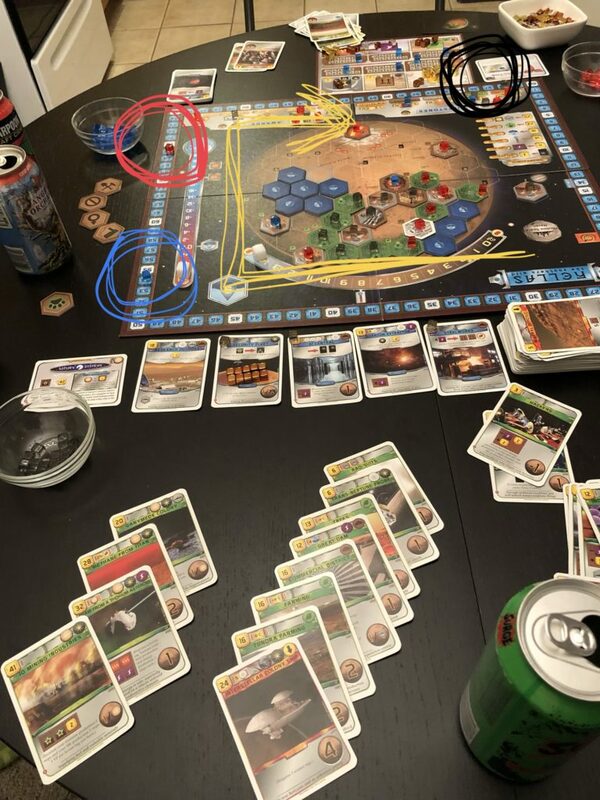 Hei Lun and our 3rd player in the game Ferrari, would keep pumping heat into mars, as well as oceans, their lead was easily 4-7 points ahead of me at any point, however, I kept my cool because I would make all those points up alone from Security Fleet. I decided my late game strategy of Victory Points, Victory Points, Victory Points. Saturn Systems is a Jovian Corporation, anytime ANY Jovian card is played, I’m allowed to gain an extra money production. Obviously that means I want to play Jovian cards (especially knowing they can combo off each other), but I realistically want them ALL to be played. A huge benefit is most Jovian cards are Space cards, and I have Titanium to punch into it, as well as the advantage of holding three great benefit cards: Research Outpost, AI Central, Quantum Extractor. In order: play cards for 1 less their cost, draw 2 cards each turn, pay 2 less for space cards. Jovian cards keep coming in my hand, and I can pay less and less for them, while still hanging on to at least one titanium for my Security Fleet. By the end of the game I would sit on 5 Jovian Cards, two of them, IO Mining Industries, and Ganymede Colony, would give me 1VP for each Jovian Tag I had, another 10VP for my end game. Although I was able to make some great combos to add cities and make more money each turn, most of that money was being pumped into some very high cost cards. I was still lagging behind on the Terraform track. Once I came to the realization that no one was building greeneries, I used that to my advantage, I would have money coming in, and I can use my newly found Steelworks to pump up the Oxygen level on Mars. Fun Fact, we used up all the temperature, and oceans before the oxygen was increased by a single point. Between my Steelworks, Strip Mining, and using all my money to add to my Greenery production, I ended up accounting for 10 of the 14 oxygen Points, a HUGE boost to my Terraform Rating. I would even account for the 3 final points to end the game before Hei Lun and Ferrari would end the game. We mostly used the last two rounds blocking each other on Awards and Milestones, virtually keeping each other close at hand by the end of the count, no one running away with the game. I hoped my late game strategy would work out and holy crap did it. Hei Lun would end the game with only 6VP on cards. I would end with 38 Victory Points, squashing Hei Lun by a score of 98 to 69… Ferrari lagged behind with 54. The main reason I’m certain I won was the advanced mode being played forcing a long game. Both Ferrari and Hei Lun were well in the lead very early, and had we the access to Greenery sooner, this would have been a different game. Because I was able to hold on and keep strong with my Jovian strategy, it allowed me to really boost on to the Greenery scene late which was huge in making up points, but then the late game VP would absolutely trounce my opponents. It took six tries at least, but this was a worthwhile victory. He’s to being a sore winner, 1-6 record. .